Now Available in Print and eBook: "Democracy’s Fourth Wave? Digital Media and the Arab Spring"
I am happy to announce that my new book, co-authored with Muzammil M. Hussain, is now available in print (Oxford University Press, Amazon, Google Books) and eBook (Kindle). 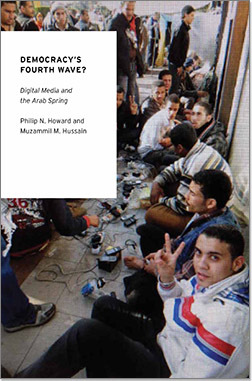 Did digital media really “cause” the Arab Spring, or is it an important factor of the story behind what might become democracy’s fourth wave? An unlikely network of citizens used digital media to start a cascade of social protest that ultimately toppled four of the world’s most entrenched dictators. Howard and Hussain find that the complex causal recipe includes several economic, political and cultural factors, but that digital media is consistently one of the most important sufficient and necessary conditions for explaining both the fragility of regimes and the success of social movements. This book looks at not only the unexpected evolution of events during the Arab Spring, but the deeper history of creative digital activism throughout the region. Philip N. Howard is Associate Professor in the Department of Communication at the University of Washington, with adjunct appointments at the Jackson School of International Studies and the Information School. Muzammil M. Hussain is a Ph.D. candidate in Communication at the University of Washington and Visiting Scientist at the Center for Comparative and International Studies, ETH Zurich.